Lighting glass is difficult because glass, well, its transparent. Glass lacks the diffuse reflections which are the dominate optical property of the vast majority of materials we shoot. To effectively light glass we need to take advantage of different optical properties; here we examine the two most common: specular reflection and refraction. There are many ways to create these lighting effects. I have chosen a very simple approachs which can be achieved with just a single off camera flash and diffuser with the idea of providing a simple starting point for the beginner. The real key to getting the best light for a particular subject is to pay close attention to both the light location and how you diffuse the light. There is an infinte range of possible images of a single subject by just varying the light sources. The best light sources are usually doubly diffused and often cleverly crafted to suit the specific needs of a particular photograph. This bottle is lit predominantly by the specular reflection off its right side. 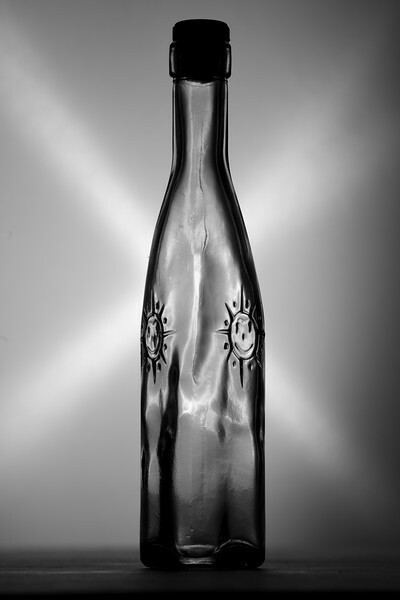 To create a visbile reflection on the bottle I have used a black back drop and placed my white diffuser to right of the bottle and slightly behind it. The flash, triggered by a Canon ST-E2 infared trigger and set to 1/8 power is on a stand behind the diffuser. 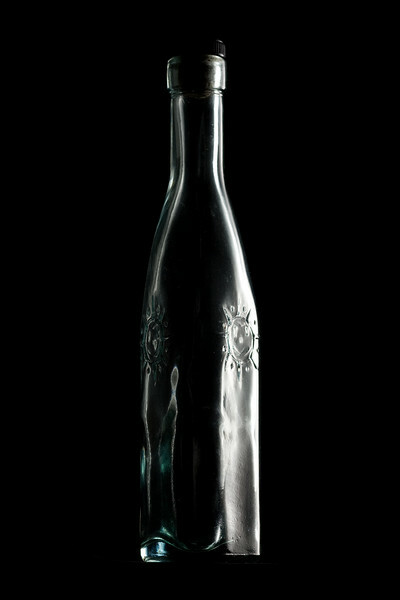 I have adjusted the bottle and flash position so the reflection of the light is visible in the flat surface on the side of this triangular bottle. 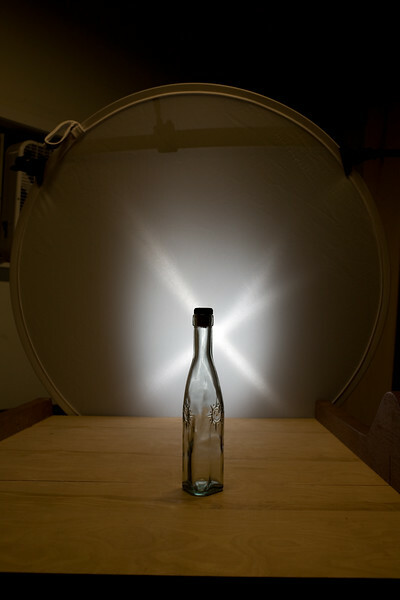 This bottle has been back lit and is visible because refraction in the glass bends the view (like a lens) to make unlit portions of the background visible as a dark outline. 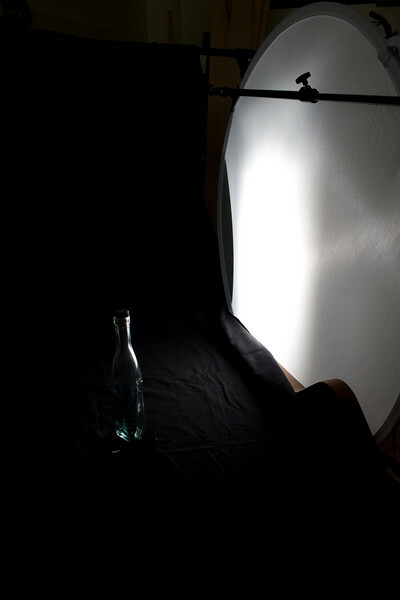 Here I have placed my diffuser directly behind the bottle and the flash zoomed to a narrow beam behind it. Exposure is set for the surface of the diffuser which is very bright, so the flash set to 1/128 power to allow an f/8 aperture. The cross in the light pattern is created by the fresnel lens in the flash at close range. That cross pattern is less than ideal for most photographs so normally I would elimiate it by using double diffusion of my light source. That, however, substantially increases the complexity of the setup. As a side note, the reason you pay good money for good quality softboxes is that they have an internal baffle specifically designed to smooth out any unevenness in the light source.